On Nov. 6, 2018, Emily Strizich strapped her 2-month-old daughter’s carseat into a green camper dubbed the “Medicaid mobile” and drove 130 miles through snow and freezing rain to Sandpoint, Idaho, to recruit last-minute voters. A pediatric occupational therapist with no political experience, Strizich was frustrated that Idaho’s Legislature refused to accept federal funds to expand Medicaid to some 91,000 low-income residents. She’d already spent 500 hours knocking on doors across the state, eventually helping collect enough signatures to put a Medicaid expansion question on the state ballot. Now it was crunch time. As the temperature dropped and her daughter slept, Strizich watched the results roll in. “It was tremendously surreal and gratifying,” she recalled: Ultimately, more than 60% of voters in this reliably red state supported the expansion. In the following months, however, state legislators repeatedly tried to kill the health-care benefits Idahoans had so clearly supported. Strizich knew that Republicans might try to fight the measure, but she’d hoped the landslide win would convince them not to. “If people are telling you to do something, you assume that, as a representative of your constituents, that’s what you would do,” she said. Though over 60% of voters in Idaho voted for Medicaid expansion, state legislators are still attempting to block the initiative. 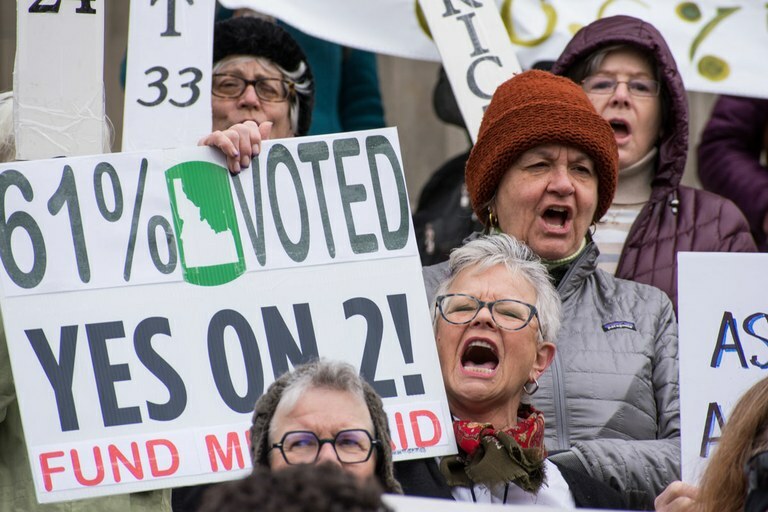 Yet in Idaho, as in many Western states, lawmakers can legally overturn or alter voter-approved ballot measures with little or no input from voters. And as Westerners reckon with issues that conservative governments have been reluctant to take up — including marijuana legalization, increased minimum wage, gun control and Medicaid expansion — legislators are increasingly attempting to block them, curtailing a century-old tradition of direct democracy. IN 1904, OREGONIANS PUT the nation’s first citizen-led measures on the state ballot, including one that would allow counties to ban alcohol sales. Voters approved the measure, kicking off Prohibition in the Beaver State and ushering in a new era of American politics — one in which laws could be created not just by legislators, but by citizens. By the 1920s, some two dozen states had adopted citizen-led ballot measures, allowing voters to legalize everything from women’s suffrage to an eight-hour workday. The practice was especially robust in the West; even today, 60% of all ballot initiatives come from Arizona, California, Colorado, North Dakota, Oregon and Washington. In response, those legislators are frequently defying voters’ wishes. In 2017, for example, South Dakota repealed voter-approved restrictions on campaign finance and lobbying. Sheriffs in 20 Washington counties are refusing to enforce gun regulations that voters overwhelmingly passed, calling them unconstitutional. And state legislators in Utah recently overhauled both medical marijuana and Medicaid expansion bills drafted and supported by voters. As a result, 60,000 Utahns who would have received Medicaid under the citizen-led initiative are still without coverage. In fact, only two states — Arizona and California — have rules preventing representatives from modifying or overturning voter-approved ballot measures. That’s not necessarily a bad thing, said Altic. Sometimes, states need to be able to tweak the language of a bill to correct clerical errors. Other times, lawmakers’ changes actually strengthen an initiative: Nevada recently revised a 2016 voter-supported law on gun control to make it more enforceable. But in addition to modifying or repealing citizen-led measures, some states are making it harder to get them on the ballot in the first place. The Idaho Legislature, for instance, is poised to pass a rule requiring citizens to collect signatures from nearly twice as many voters in a fraction of the time currently allowed before a measure can appear on the ballot. The bill’s sponsor, Republican Scott Grow, says this will prevent voters from being burdened with too many initiatives. Arizona, Utah and Montana are considering similar laws. Such attempts to curb citizen initiatives are the most brazen in recent history, Altic said. And so far, few, if any, legislators have faced political consequences. AS OF PRESS TIME, IDAHO'S Legislature was locked in a battle over Medicaid expansion. Some GOP lawmakers were trying to pass a bill that would require people seeking Medicaid to prove they’re working or in school, and end the expansion altogether if federal funding dropped. Republican Gov. Brad Little, meanwhile, was refusing to let the Legislature adjourn without funding the expansion. Krista Langlois is a correspondent with High Country News. She writes from Durango, Colorado.